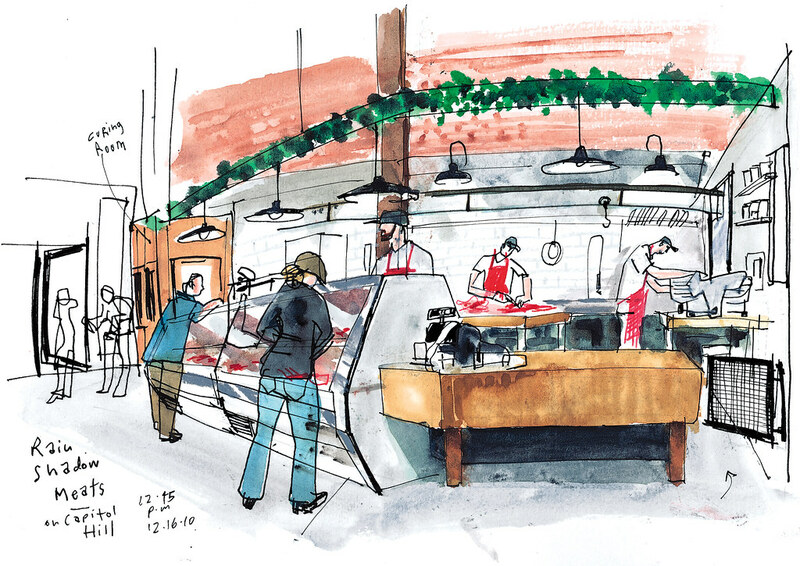 A visit to Rain Shadow Meats on Capitol Hill’s Melrose Market brought back memories of my childhood holiday feasts in rural Spain. In Montemolín, the little town where my parents grew up, the tradition is to slaughter a pig every Christmas — I’ve actually seen my dad kill and prepare one. 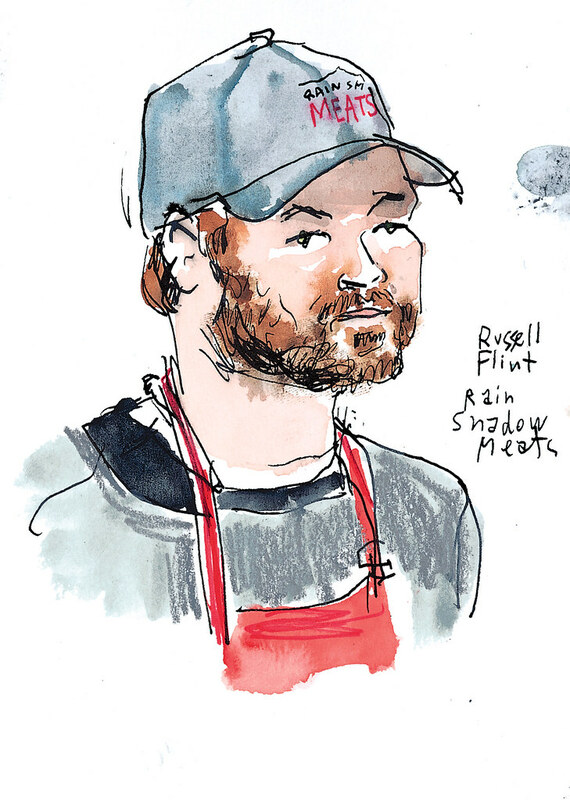 Flint, 32, started his old-fashioned butcher shop in April to bring back the meat business to what it used to be, providing a direct link between the farm and the consumer. That’s why he only sells locally grown meats and charcuterie. A whole pig in his freezer came days earlier from Yarmuth Farms in Darrington. The pork loin that will soon become a magnificient crown roast on somebody’s holiday table came from Carlton Farms in Oregon. 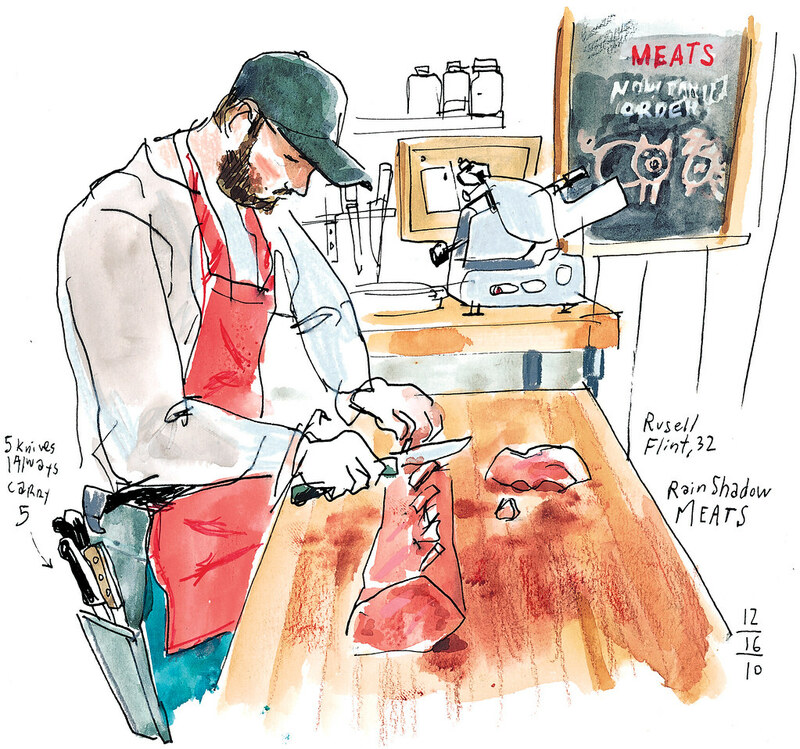 With butchers like Flint, the tradition of feasting on meat from our backyards seems likelier to survive. Flint uses five different types of knives to perform his job. On this sketch you can see him “frenching” a pork loin, cleaning the fat around the bones for better presentation. Flint said he was just by himself when he opened the shop in April, but now has four employees. 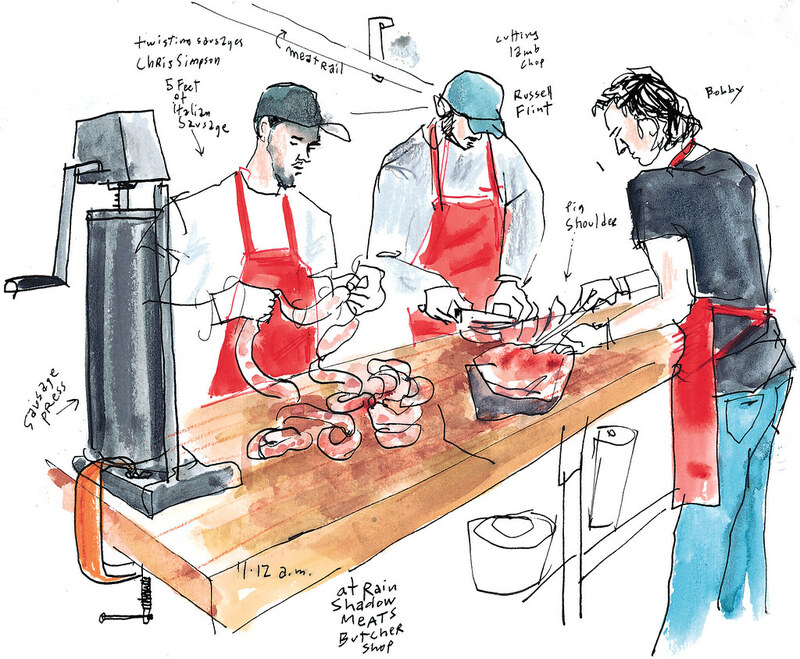 I did this sketch while Chris Simpson prepared Italian-style sausages, Bobby Palmquist worked on a pig shoulder and Flint cut lamb chops. A very interesting scene to draw! Sketch-worthy Seattle. Where should I take my sketchpad next? Do you know of a good sketch story waiting to be drawn? I’d love to learn about it. You can send me your suggestions to gcampanario@seattletimes.com or via Facebook or Twitter. Have a great weekend!